Could Aliens Be Behind Incoming Fast Radio Wave Bursts? 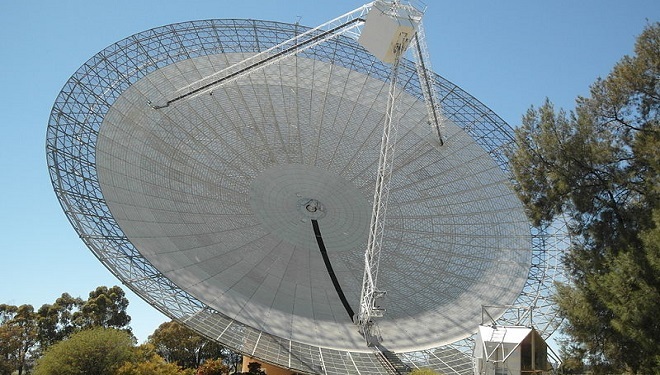 The first instance of what scientists are calling a “fast radio burst” (1) was detected by Dr. R. Lorimar in 2007, looking through archival data collected by the Parkes Radio Telescope in Australia. Parkes was one of the dishes that transmitted television signals from the lunar surface during the Apollo moon landings, as depicted by the 1999 film “The Dish” (2). The event took place in 2001 and lasted just five milliseconds. The signal was dispersed over a wide range of frequencies, suggesting that it had passed through millions, perhaps billions of light years of cosmic dust that had spread the signal out as a prism spreads out visible light. Whatever originated the FRB was hundreds of millions of times more energetic than the sun, suggesting a catastrophic event of cosmic proportions taking place beyond our galaxy. Scientists believe that the phenomenon may take place as often as 10,000 times a day in the universe. Several more FRBs have been found, all but one by the Parkes observatory, in the southern hemisphere. The exception was detected by the Arecibo Radio Telescope in Puerto Rico in 2014, having taken place in 2012. The first and thus far only FRB to have been observed live took place on May 14, 2014 (3), and was observed by Parkes once again. This event, since it was observed in real time, allowed other observatories around the world to scan that region of sky. Dozens of theories exist as to what is causing these FRBs. Currently, the leading contender is that it is a flare from a neutron star with a magnetic field a million, billion times more powerful than Earth’s. Other theories include supernovas, snapping cosmic strings, floating black holes, and collisions of two neutron stars or two white dwarves. The origin of FRBs remains one of the most puzzling mysteries in astronomy. Naturally, the theory that FRBs are the result of an alien intelligence (4), perhaps sending up what would be the cosmic equivalent of a flare, is being entertained in some quarters. One study noted that the dispersal measure, which indicates how much dust and debris the signal has passed through, is in multiples of 187.5. The chances of this happening naturally for each of the FRBs that have been detected is five in 10,000. Statistical Fluke or Alien Communication? Most scientists believe that the dispersal measure is a statistical fluke that will go away once more FRBs are detected and quantified. The alien origin theory is not greatly entertained by the scientific community and would be considered only after all natural origin theories have been exhausted. What aliens would be trying to tell us with millisecond bursts from beyond our galaxy, besides “Hello, we’re here!” is open to question. Scientists have been trying to find signals from alien civilizations since Project Ozma in 1960. SETI, the Search for Extra-Terrestrial Intelligence, is ongoing, thus far without success. The most scientifically accurate depiction of how an alien signal would be detected was shown in the 1996 film “Contact” (5). In the movie, a radio telescope detects a television signal that is essentially the first major broadcast from Earth that took place during the 1936 Olympic Games in Berlin. The signal was meant to impart that the aliens had heard us and were responding. The television signal had another signal imbedded within it, the contents of which drove the main plot of the movie. The detection of a signal that is indisputably alien in origin would be a world historic event. But even if FRBs are a natural phenomenon, as most scientists think, studying them will unlock more secrets of the universe for the expansion of scientific knowledge and the betterment of humankind.